A colonel in the Third Reich. Landa is the main villain in the film. 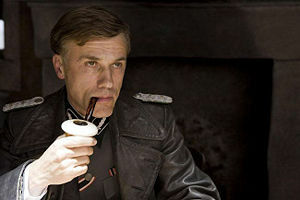 The character of Col. Hans Landa is a professional hunter of jews during WWII. Seeing that this is essentially a "Spaghetti Western set in WWII", it is most likely that he was inspired by characters like Col. Douglas Mortimer from Sergio Leone's For A Few Dollars More. In that film, Mortimer was a wily bounty hunter who, like Landa also smoked a pipe Sherlock Holmes style. In addition, Tarantino's stories revolve around outsiders and ambiguous anti-heroes, and are influenced by the colorful banditos and bounty killers that permeated spaghetti westerns. This page was last edited on 9 January 2011, at 12:14.